To Clean Fresh Cactus Paddles: Rinse fresh cactus paddles under cold water, being careful not to prick your fingers with the small thorns on its surface. Using a vegetable peeler or small sharp knife, peel away the darker bumps where thorns grow, as well as the thorns, trying not to peel off all the outer dark green skin. Lay the paddles flat on a chopping board, then trim around approximately 1/4 inch of the edges and 1/2 inch of the thick base. Once cleaned, rinse and dice into 1/2-to-1-inch squares, to your liking. To Use Cactus From A Can, Bag or Jar: After you have removed the diced cactus from the jar or can, rinse it under water and drain well. To Cook the Cactus: Heat two tablespoons of the oil in a thick, large-sized skillet (one that has a lid) over medium-high heat. Add the diced cactus, stir in the salt and stir for a minute or two. Place the lid on the skillet. Reduce the heat to medium and let the cactus cook and sweat for about 20 minutes, until it has exuded a gelatinous liquid that will begin to dry out (NOTE: If using cactus from a can or jar, already cleaned and cooked, just cook for an additional five minutes). Take the lid off the skillet, stir and make sure most of that gelatinous substance has dried up. If it hasn’t, let the cactus cook for a few more minutes until it does. Let the cactus cool slightly. In a mixing bowl, toss the cactus with the tomato, onion, jalapeño, cilantro, lime juice and salt. Like this, it can be eaten as a cactus paddle, nopal salad! 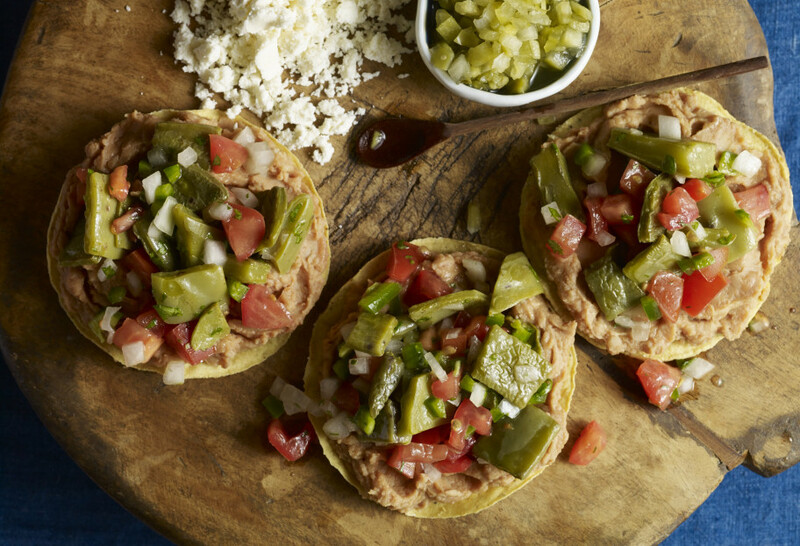 To Assemble the Tostadas: Spread a layer of refried beans on each tostada. Spoon some the cooked cactus mixture on top, and add the garnishes of your choice. I add avocado slices, queso fresco, Mexican crema and salsa verde!